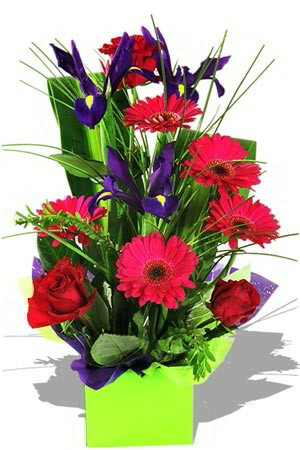 Win over that special someone with this stunning, utterly original, boxed arrangement of purple Iris, scarlet Gerberas and crimson Roses. Alluring makes a suitable gift solution for almost every occasion, you just can't lose with this choiceWe recommend sending a double surprise by adding a Premium Box of Chocolates to Alluring. Most standard floral orders delivered to metropolitan areas have a reduced delivery charge of 600.00PHP. I know the flowers were received on Friday 10th as I requested. This is a repeat order and as before the recipient said, "Thank You for my BEAUTIFUL FLOWERS." I was sent a photo and they are absolutely fabulous. Delivery was as requested and the whole experience was very easy, given I only needed to change the message and pay. Thanks for a very positive experience for me and my recipient.